In the last several months, we had to replace both a toaster and a toaster oven. Both of the now-dead appliances were pretty basic, no-frills items, but they did their jobs. And then they stopped. The toaster conked out first. In the few weeks it took to settle on a replacement, having the toaster oven as a back-up was really nice (if less efficient than using the toaster for simple tasks like toasting bread). I first turned to Craigslist, hoping for a decent used toaster, but that effort was unsuccessful. Whenever we’re buying new, we try to read some reviews to help pick a good value product. Unfortunately, most reviews don’t provide a good test of lifespan, unless the product dies very quickly. We opted for this rather basic model, and chose the standard dial rather than the digital display, since a digital display seemed like one more thing that could break. We’ve had the toaster for a number of months now, and so far, so good. Then, several weeks ago, our toaster oven started malfunctioning. The heating elements on the bottom were getting hot, but those on the top were not. The top heating elements are essential to the “broil” function, which is something we use a good bit, for broiling tofu, asparagus, etc. I succeeded in finding a replacement on Craigslist. The replacement is actually an upgrade, I guess, to a much larger toaster oven that includes a convection oven feature. The thing is, the small toaster oven was really pretty ideal for our needs, which included broiling small batches of things and reheating things that we wanted to crisp up a bit, like pizza and croissants. When not in use, it stored easily under the counter and didn’t take up precious counter space. If we actually want to bake anything, we usually do so in a quantity that exceeds the capacity of even a large toaster oven, and thus necessitates the real oven. The new toaster oven (bottom) could eat the old toaster oven for breakfast! This new toaster oven is a bit of a beast, and more toaster oven than we really need. It’s too big to fit under the counter, even if I wanted to be moving it around all the time, which I don’t, given it’s bulk and weight, so it’s permanently using counter real estate. While I haven’t tested it yet (time to pull out the Kill-A-Watt meter), I imagine it chews more energy that our previous, much smaller toaster oven, because there is more space to heat to the desired temperature. If we were using that space, it wouldn’t be a big deal, but, most of the time, we are not. I spent the first week with the new toaster oven seriously questioning my purchase. The previous owner had attempted to clean it, which was nice, but the oven cleaner fumes coming off the thing were overwhelming, to the point of potentially rendering it unusable. I placed an open container of baking soda inside for a few days, but it had little effect. Then I found a suggestion to place a pan of water in the oven, turn it to 400° F, and leave it on until the water came to a boil. I decided it would take a really long time to boil an open pan of water in the oven, so I cheated a bit, and preheated the water in the microwave, then poured it into a metal bread pan in the hot toaster oven. I left it in, with the oven on, for about 30 minutes. Lo and behold, this did the trick, and we now have a fully usuable, de-stinkified toaster oven! 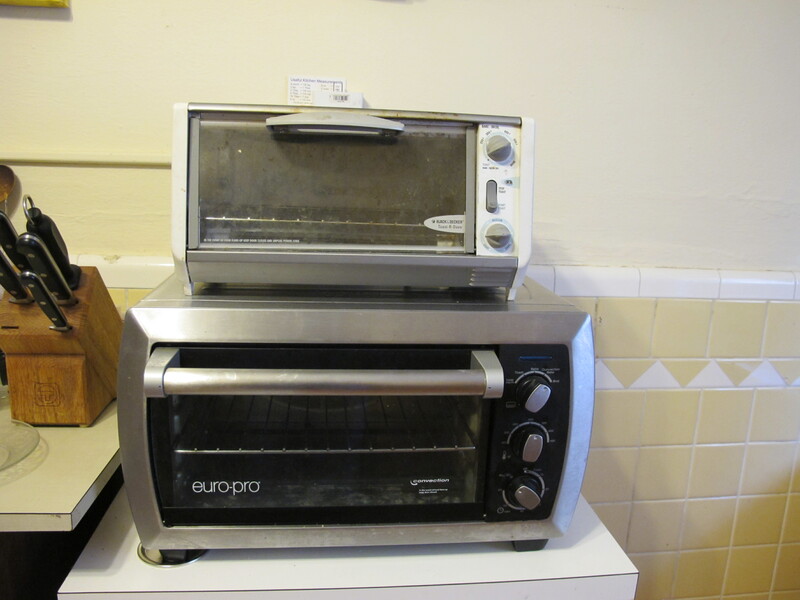 This entry was posted in Food and tagged buy used, Craigslist, waste. Bookmark the permalink.